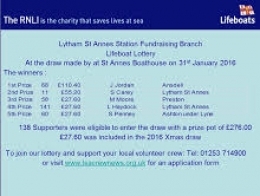 Lytham St Annes Lifeboat Operate a Lottery, priced at only £5 per month (£60 p.a.) limited to 250 members with 4 great cash prizes and a special Christmas draw for this who have been members for 6 months or more and pay by Standing Order. All proceeds go to the running of the RNLI Lytham St Annes Lifeboat Station. You could win a fantastic cash prize and be a real winner with the crew too! A great gift for Christmas or any time of the year.